Approximately 2-3 miles south-east of the city of Sapporo within confines of area known as "Northern Army Headquarters". Twelve aviators were confined to a single room, approximately 15 ft x 20 ft.- 3 guards on duty around the clock. Others- not all known - were held in the jail. 15 Aug 1945: informed of surrender- told to remain in camp11 Sept 1945: Moved by bus to local airstrip- flown to Okinawa and on to Manila. Men are listed on the rescue rosters for Hak-04B-Ashibetsu. The Zack Crew - B-25 mission, crash and capture - rare color photos. Includes picture of crashed plane taken by the Japanes interpreter. Picture #1 - SC214329 Aerial view. The jail was the large building with a central tower and four "wings". 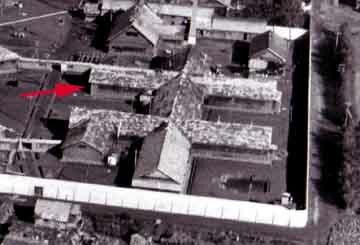 The building holding the 12 men is indicated with red arrow. Picture #2 - Detail of holding barracks for the 12 flyers. Contains both the Military Police Jail and the Sapporo "holding" camp. Technically, not a POW camp but considered as such by the Japanese in the 15 Aug 1945 report to MacArthur. First known to be occupied by American flyers captured in China. 12 Americans arrived 7 July 1945, a.k.a., the "diddled dozen". They came over with the China Marines and were kept separate at all times. After the surrender, 15 August 1945, some 10 more men were brought into the camp from the local Kempi Tai jails including two Wake Island sailors, convicted for escaping and, apparently, and some ten more, including two more flyers, Wood and Rouse, who were added to the roster. We are indebted to former POW, Milt Zack for these names. POW Roster: [Americans and British] - Only one list found but we know there was a final total of 25 men, including three Brits, held at time of rescue. Extra names courtesy of Milton Zack. "Sapporo was not an established camp but a make shift or rather temporary holding place for 12 American pilots captured in the last year of the war. We had been in the Shanghai camp and always segregated from the 1000 other prisoners there - not being allowed to talk or associate with them. This was enforced by a special guard with us day and night. The Shanghai camp moved to Peking for a month and then to Japan. We were separated entirely from the others and quartered in a vacant building at Northern Army Headquarters, just at the edge of Sapporo. That is why I think of it not as a camp but merely a place of confinement." 2nd Lt Samuel McMillan Jr, West Hartford CT. 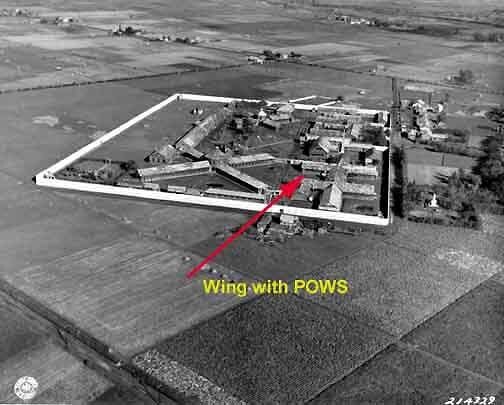 Details his capture and sequence of POW camps. Article about McMillan - "This Flying Tiger Survived A Japanese Prison Camp"